Aislinn has worked in fitness all her life. She set up BootyFit as she’s passionate about people feeling better about themselves, although found people that may most benefit from exercise, often felt too nervous or self conscious or attend. So BootyFit was created to offer an atmosphere where every female was welcome……fitness level, size and what you wear is not important. Being made to feel welcome and having fun is top of the agenda! How can we put it mildly…..Shelley is crazy about exercise!!! She’s always enjoyed exercise, although became very focussed after gaining 5 stone during pregnancy. She totally understands the concept of eating for two (celebrations were her pregnancy craving) so now exercise is part of her daily life. She loves weights, makes press-ups look easy and knows how to throw a punch on the pads. Although her ultimate favourite is running as she loves the feeling of freedom and appreciating what her body can do. Shelley is one of the regular running trainers but she’s also the ‘organiser’ at BootyFit. From spreadsheets to the social calendar, she’s your girl. As she loves cooking and studying nutrition she looks after all of the food content with our online programmes. Well, they say it runs in the family! 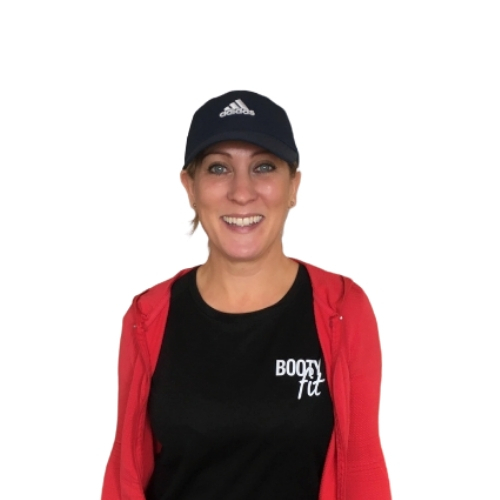 Meet our recently qualified BootyFit instructor, Lynsey who is Shelley’s sister and also a fan of exercise. Lynsey started running ten years ago when she hit a low following a prior relationship split. She wanted to build herself up again and after a number of years of gym memberships which she could never quite gel with, one day she decided to put on her iPod and go out for a little walk/jog for the first time. Ten years later she’s never looked back and today maintains a healthy running distance of around 15-20 miles a week. Running is Lynsey’s passion and something she describes as “the best medicine of all” which she relates to more in recent times where one of life’s blows tried to take her “off her running track”. After some BootyFit encouragement to get her back on track again, it has proved to her just how powerful and healing running is and it has increased her love of running so much that she’s now a running instructor. Lynsey is also a real people person and gains great pleasure in motivating others to meet their fitness goals and seeing them happy.